Have you tried the central New York chow rescue as they have some black girls. 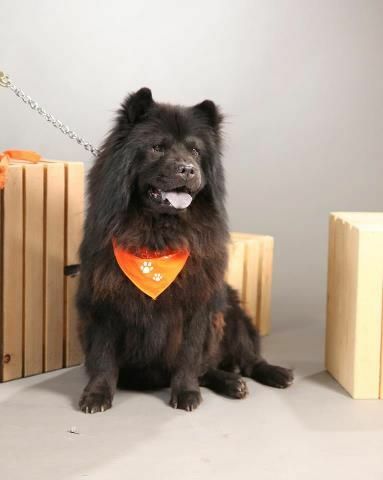 I dont know how far they are from you but they do send chows some distances and collect from way out of state so they may be able to help you with transport. Just a thought. You have got to give it a little time! I feel a little stupid for saying this, but you DO know that this new dog is going to be all her own person? I just don't want you to feel disappointed when she does turn out to not be exactly like Tess, especially if you choose based on looks. Her character might be completely different from Tess'. But you'll learn to love it just as much as you loved Tess' character! 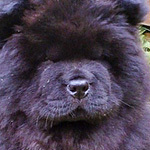 I love the Chow breed. I know there will be no other like our Tess. We had amazing past adventures & she was our last family dog (Chow). Opening our hearts, opening our feelings to another just feels right. I only wish I started feeling this way earlier in the year, but we had a wonderful summer on the bike. I will be turning 67, but there is a lot of life in this old girl, enough to hike a few more trails, or leisurely work in the woods with a Chow girl by my side. The reason I like the rough coat, open face chow is simple. I loved grooming Tess, and had a couple of bad experiences with a certain closed faced chow. I also love the smell of Chow fur, it's like the memories of my childhood, fresh clean clothes drying in the sunshine. I need a big Chow. If you read your story we now live in Montana & are on a wildlife corridor, little dogs, even dogs that weigh 35 lbs. do not fair well up here. The Chow needn't be black - another color is ok. The snow is beginning to fly up here in the Rockies, it maybe spring when traveling is easier to get another Chow to us. I have contacted the shelters up here, they made notes in their books. I did attempt to adopt less than a week ago, but found that they had misrepresented what they first said. I got emotionally roped in to a situation that wasn't good for anyone, including the Chow. Our family, Mike & I are Chow knowledgeable & understand the breed, with all the quirks that compose a Chow. 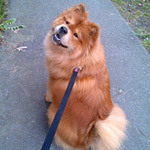 Tess wasn't my first Chow, even though I was just a child, I still remember my Ginger, he was a Chow X. A Chow would have a mighty fine life on this here mountain! Yes, you will get a chow to love just as much as you loved Tess. When our Milly died three years this last August, we were broken hearted, even though we still had Mabel. Fred desperately wanted another little girl chow - "......another Milly" he told me and I was so worried for him and kept comforting him and telling him he would never get "another Milly". Then we went to see the litter of three and chose Matilda. Or to be more exact, we think she chose Fred. Of the three of them, she kept going up to him, sitting down and giving him a paw. she was six weeks old and two weeks later we brought her home. Fred reckons she is "......just like Milly" but in reality, she is Matilda, a beautiful chow chow who we love dearly. When they were five months old, the breeder told us that she needed to find a home for Maisie - we bought her and have our second pair of litter sisters. Fred reckons "........they are just like Milly and Mabel" - in reality, they are two litter sisters who are devoted to each other and to us and we love them just as much as we loved Milly and Mabel. Also, you are right, I was 67 yrs. old when we brought Matilda home - I am 70 yrs. old now and there are still a good few years left in me - you will get your Chow Chow and smell the wonderful fur and look into a pair of beautiful eyes. Sorry things did not turn out the other day - but there is one waiting for you - you just have not found each other yet. I have a couple suggestions. TLC Chow Rescue has this baby. http://www.petfinder.com/petdetail/24678126 While not an older animal, she has the bad luck of being black, and a mix. You could teach this sweetheart the ways of the 20 acre wood. Also, I think they currently have one of my Dillon's sisters from that horrible situation down in Georgia. She is a blue. If she is still with them, I can tell you she is likely damaged like my Dillon. Beautiful Chow but never socialized. The human touch is over-whelming to my Dillon. Also, there could be no free roaming, but a 30 foot tether and a little work could take you many places. I love Dillon so much. He has come a long way and continues to improve every day. But will he ever be like the other Chows? No...I'm telling you this to give you something to think about. These Chows (the Georgia group) are basically unadoptable because of the cruelty of humans. Anyway, the Harrises bend over backwards to transport their Chows. Give them a call. Even if the 2 I mentioned aren't the one for you, Larry has a line on many, many more. I guess this is ok to say, for you all know me. From the experience this week I feel a little down. I'm kind of licking my wounds so to speak, being quiet - was wondering even if I should post. A tether wouldn't do up here. We are really rural, up in the mountains. We live with bear around us. Puma's hide from us but we know they are there. I've taken walks (alone) and had a moose cross my path. We even have wolves. We've seen several on our land. We have a resident deer herd, one deer the littlest doe stares into the window wanting peanuts or what ever other goodies we give her (she is the only one we hand feed). She is the matriarch. I remember when she was first born, Tess & I started down the path to the creek & I saw her, she was new born on shaky legs. I took Tess gently back to the cabin. We didn't go back to the creek for about a week. Tess would only run the deer out of the clearing back into the forest no farther. We have had several bear circle our cabin looking into the windows, all three of us going from window to window looking at the bear. Tess even stood up to a bear, I have the story here. I think the bear was quizzical about Tess. When I went out to the front porch I shouted at the bear and the bear ran back into the forest with Tess giving a short chase. I don't think we should have a young Chow, since we are in going into our late sixties. I see some descriptions of dogs in shelters and the reason they are there is because their owners died or had to go to a nursing home. Up here the shelters are not kill shelters and keep the dogs & cats until they can find a home. I want to be able to do some hiking, so I really want a middle aged Chow. When Tess first came to us she was full of it - zoomies, block & tackle with Mike. She was able to jump into bed; take Matt for the fastest runs around city blocks. As we retired up here Tess too retired, got older, slower, happy to walk at a gentle pace. I never went over a mile an a half with her and only took her on dirt roads. I had to watch her over heating or sore back. She couldn't even jump in our bed (and I knew she wanted to). This is why I have my heart set on a middle aged large (old fashioned) Chow. I have been looking, even before my heart opened. There are so many two year olds in shelters, rescues; so many seniors too. Two sides of a coin; the younger ones the owner didn't understand what a Chow is all about & probably spawned bad behavior. The seniors, the owners don't want to take or unable to take medical responsibility or to be able to make that heart wrenching decision to put the ailing terminal Chow down. I have tears for all of them. I have Chow Rescue sites saved. I look on Petfinders every day. I have notified the shelters of my wish, and they have put me in their books.... I think winter is going to be a hard one, the snows have started. That in it's self makes travel & transportation hard. I will keep looking every day. I will have another Chow girl by spring or summer, all though it would be nice to have a Chow girl at Christmas. Mike asked me what I wanted for Christmas: "A Chow Girl." Thank you all for your encouragement and I will be taking and seeking advise along the way. My Tessy made it so easy, just showing up, all the neighbors running after her as she ran into our back yard, & sat between Mike & his Harley. She picked us & never strayed. I feel so sad for you but I know it will happen. 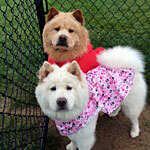 Chow chow rescue of Central New York, has an 8 year old girl, Sarabi. She's lovely. She is on their site. Dang I'm begining to feel like Jeff! I am looking at a young girl in San Pedro. She's only a year old - we did want an older girl, but if something happens to us (hopefully not) our shelter holds on to the dogs until it finds a home. She is small & I really don't think she was treated properly. We have had puppies in the past - two Ausies. She would surely have the best home up here. 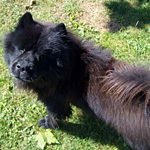 I am working with a chow rescue, but need all the help I can get to get her up here to Kalispell Montana. If anyone has any ideas or ways to transport - it would be cool to get her via car relay. She deserves a good home. The snows are falling. Maybe I am trying to do this too late. I took a really nice hike yesterday, it was around 20 degrees, the hike was a mile and a half.....I did take a little fall, but got myself up and "brushed my self off" & just kept going. It was the first fall I had all year - even when I was working beyond our creek I was really careful. Keep good thoughts coming our way - prayers too if appropriate. Thank you. Last edited by Me & Tess on Tue Dec 11, 2012 5:45 am, edited 2 times in total. I understand you when you said you felt alittle down and licking your wounds. I went through that too this past summer.. I was in search for a chow puppy after losing Nikki last year. I waited a while and missed the pitter patter of those little paws in the morning to greet me and those big brown eyes that told me every day how much she loved being here with us.. I contacted so many places I was getting confused on who I talked to and who I hadn't talked to. And listening to breeders trash talk each other and having to sign a contract that had so many stipulations that I wasn't sure if I owned the dog or they did (some were the standard contracts but there were some pretty crazy ones too) . I know you will find a chow that would love the mountain area you live in. Just keep all lines of communication open and it will happen..and don't be afraid to say no if its not the right fit. You know what you need to look for.. believe me I had to turn down a few and it wasn't easy. I fully understand how you feel in regards to your loss of Tess and now trying to find another furbaby to fill the void she left in your life. I lost my beloved Chloe roughly two years ago at the age of 15. I had rescued her when she was 2, yet I think I was the one who was rescued by her. I feel it was Chloe’s spirit who guided me to this website for which I am so thankful. In August 2011 I came across a posting here regarding my current rescue. There were some ups and downs then God smiled down on me and Whitby came to live with me on Dec. 17, 2012. Just a thought / suggestion regarding the girl you have found in San Pedro. Perhaps post a request here for help with a transport from San Pedro to your home in Kalispell. I was fortunate last Dec. when I rescued Whitby. The couple , (who I like to refer to as Santa Paws), in Chicago, Illinois. drove half way to meet me and relay her to me. Wishing you the best. Maybe there is a Santa Paws out there for you. This may be my last post on my Tess & Me site. We have just adopted a little chowling girl. She's five years old, a rescue from Yakima, Washington. I saw her on Petfinders on Christmas day, contacted the shelter, added my Tess & Me site and made an application. I was contacted the next day. I asked them "how do we get approved?" They said we already were. We drove to Missoula on Thursday - we picked her up from the meeting site at 12:30 am on Friday. There is a lot more to the story so I will get a new post about my Lilly up soon. Her owners had her since she was a pup, had to move and couldn't take her. I was thinking of Tess last night. Of course she chose us as an adult, head butted herself into the middle of our lives. We had her five years before we made our move to Montana. There was no way we could have left her. If we left her I am not sure what would have happened to her. She was such a strong Chowbeing. We even took a one room apartment up in the middle of no where & paid top dollor for rent, as much as we would have if we rented a whole house while we waited for our cabin to be built. This little apartment was "dog" friendly and the houses were not. I still cry when I think of my dear Tess. This is really true, I have been seeing little wisps of black fur here and there in the cabin. At first it was just something I saw and thought little of it. I hope it is a sign from Tess that she approves. I have a huge smile on my face and tears of joy in my eyes. I AM so happy for you and for Lilly too. I can't wait to hear/read all about her and the wonderful things you will enjoy together. Oh My Goodness, went to her petfinder site and saw her. She is SO cute, a little petite lady, with a beautiful coat. And I just love her little tipped down ears. And her pretty little shy expression. Happy New Year with your new girl. I am so happy for you. I am so happy. I will start our story soon. Lilly is doing good. It was a hard time at first for her leaving her home of five years. I think she loves the freedom that she is going to have in time. She is still on the leash when we walk. We walked this evening of the New Year. She is a little Chow girl but she has the heart of a lion. There has been decisions I have had to make with Lilly that I didn't have to make with Tess. She loves to be with me in the kitchen. She is very food oriented. I want more for her. It has been in the teens up here in the North Country. Lilly is a wonderful girl, with a wonderful life ahead of her. Well sounds like we all are in tears of joy for you and Lilly!! What a happy way to start the new year!! Lilly is absolutely adorable and looks like you will have lots of chow fur to groom!! Iam sooooooo happy for you! and yes I believe Tess telling you she approves ! Bests wishes for many happy New Years together!!! What a wonderful post to read when I came here for New Year. I am so happy for you. I know Lilly will grow and develope with you both to encourage her. Her courage will grow with her personality and one day you will look at her in amazement and hardly recognise the gentle shy little lady who came to you for Christmas. I am just so happy for you. I hope sometimes you will still post here for Tess. She will always be part of your life and memories and has touched so many hearts through this thread. You will be reminded of her so many times in the years to come. Yes, please keep "Tess and Me" going. Your memories are so lovely. Then you can have a "Lilly and Me". Add me to the tears of joy club. I am so happy for you and Lilly looks like an absolute sweetheart. I too am looking forward to the new Lilly and me thread to come. Well, Merry Christmas. I knew once you started looking it would only be a short time before you found the one. I also cannot imagine giving up my furbabies. It would be something only when there was no other option at all. I am sure Miss Lilly will soon adjust. Congrats on this beautiful girl. I just read about your GREAT news. Tears of joy are trickling down my cheeks and I did my happy dance. I’m so-o-o happy for you! What a wonderful Christmas present for you, Mike and Lilly. I guess Santa Paws was listening. I’m so glad you came to her rescue. I’m one of those people who get excited and are so thankful when an older pup is rescued and given a new start in life and love. My beloved Chloe was two when I rescued her and she passed away at 15 yrs of age. Last December (2011) Santa Paws helped me rescue my Whitby. She is now 7 years old. I’m looking forward to hearing more about Lilly and the times you share together getting to know and love each other as you and Tess did. She’s a lucky pup to have you for her new mom. I think the wisps of black fur you are seeing here and there are Tess’s way of reaching out to you and letting you know she approves. She knows she had a great home and life with you and now she wants Lilly to have the same. I have dearly loved reading your postings “Tess and Me“. There have been times as I’ve was reading a post of yours I could close my eyes and feel like I was right there with you and Tess. It would be nice if you would continue to add to the Tess and Me posting now and then. Sending you purple kisses and hugs from Whitby and me.